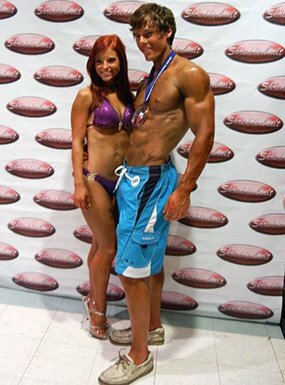 Lifting became more than a hobby when Chris committed to compete in an NPC show with his girlfriend. As the bar took more weight, the fat came off to reveal his shredded physique! I played rugby throughout college and lifted weights to stay big and strong so I could take and deliver hits without breaking in half. I was happy at 190-200 pounds and 15-20 percent body fat. I also enjoyed partying every weekend, which kept my body fat high. When I joined the Bodybuilding.com forums, I saw others with amazing conditioning and results and was inspired to achieve the same. At that time, my girlfriend decided to compete in an NPC bikini competition and I committed to compete in men's physique at the same competition (NPC Texas State Naturals). About 15 weeks from the show, I started to diet with the aid of Layne Norton's contest prep article. I competed, placed fourth, and was satisfied, but I was still hungry and decided to compete again at the NPC Lackland Classic Bodybuilding and Physique Show. I took first place in my class and won the overall title in men's physique at that show. I trained with weights 4-5 times per week and did high-intensity cardio sessions twice per week. I also kept a strict diet. I enjoy weight training, so that wasn't as hard, but the diet and cardio were brutal at times. I overcame it with motivation from other competitors, forum members, and my girlfriend who did the contest with me. 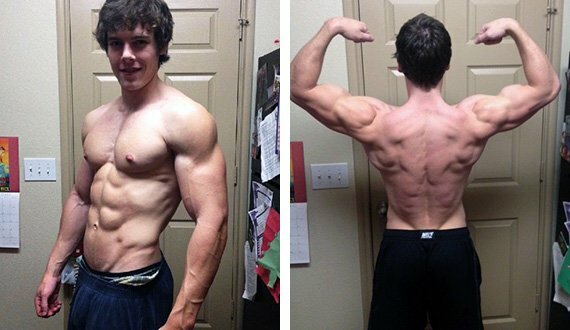 I watched motivational videos on simplyshredded.com, which helped. I ate 1-1.3 grams of protein per pound of body weight and 0.3 grams of fat per pound of body weight. I got the rest of my calories from carbs. To create a caloric deficit and burn fat, I started by subtracting 200-300 calories of carbs from my diet. As time went on and progress slowed, I removed more carbs or fat to keep the progress going. I got most of my macronutrients from healthy sources like whey protein, chicken, fish, sweet potatoes, rice cakes, oatmeal, avocados, and nuts. Protein brownies made from whey powder made for a great healthy, tasty, and filling meal that fit into my diet. Layne Norton's cutting article was great help for my nutrition plan. I followed a three-day, full-body routine or a four-day, double-split routine that alternated between two days of strength-oriented training and two days of high-rep, muscle-building training. For the duration of my transformation, I mainly used the four-day, double-split routine. The final stages of the diet challenged me most. The last four weeks of contest prep are intense. I love eating, so it was hard to stick to it, but I found motivation through others in great shape and imagining my results onstage. I'm certain that I will enter the NPC Team Universe competition and hopefully turn pro. I will build more muscle, get leaner, and bring up some weak points. I just launched a personal training business that offers a variety of online and in-person training services at ChrisProtein.com. I landed a fitness modeling contract for Naturally Fit Agency and I'm excited. The rewards are worth it. Next time you think about quitting or cheating, think of the positive rewards you get for sticking it out and following through. You will feel awesome to hit your goals. Make sure to follow a good nutrition and training regimen. There are lots of subpar routines and diet plans available that don't yield good results. If you engage in a serious fat loss or muscle building program, invest time to research how to accomplish your goals or invest the money in someone who knows what they're doing. This keeps you confident and motivates you to put out full effort. Bodybuilding.com helped tremendously. I order my supplements from the site and they arrive fast. I also use articles from the site to help with my diet, training, and peak weeks for my shows. Seeing other successes on the site is motivating as well.